CometVisu is configured by editing the XML-formatted configuration file “visu_config.xml” in the respective subdirectory ”./config” of the CometVisu installation. This can be done either with a text-based editor or with the integrated graphical editor. However, the use of the graphical editor assumes that the CometVisu is delivered by a PHP-enabled web server (e.g. Apache or Lighttpd) and that the configuration file is writable by it. The easiest way to access the various configuration files is via Manager. If the CometVisu should be connected directly to the KNX bus telegram traffic with the help of the knxd daemon (KNX is then the backend), the CometVisu is manually added to the directory tree “/var/www/visu...” of the web server (e.g. Apache or Lighttpd) The web server usually listens on port 80 in the default setting. If openHAB is used as the backend for the CometVisu, the CometVisu files must be in the openHAB directory tree. The openHAB own web server is addressed in the default setting via port 8080 and is not php-capable. In this case you have to be satisfied with a text-based editor or “divert” the probably parallel running web server (for example Apache or Lighttpd). If openHAB was automatically installed via apt-get, the CometVisu will be installed manually in “/usr/share/openhab/webapps/visu...”. If openHAB was manually installed in e.g. “/opt/openHAB”, the CometVisu is installed manually in “/opt/openhab/www/visu...”. If the XML-formatted configuration file “visu_config.xml” is to be edited directly by the (advanced) user, it is advisable to use an XML-compatible editor for this, which i.a. coloring syntax for better readability (e.g., Textwrangler on MacOSX, WordPad ++, Notepad ++ or MS XML Editor 2007 on Windows, and on Linux, for example, vi with ”: syntax on”). General information about the CometVisu XML format can be found here, information on the individual widgets in the respective sub-pages. Some widgets and plugins require additional information that should not be included in the config file, as it is freely readable to the web browser (depending on the environment installed, the transport can be encrypted using HTTPS, but the content is handled by the Users on the browser with appropriate tricks readable). By using the Hidden Configurations this information can remain on the better protected server. After saving, no process reboot is necessary, but you should reload the page and clear the browser cache. If the XML file is invalid, an error message is displayed when loading the Visu in the web browser. This usually gives exact information about where in the file the error lies. You can also force the check with the link “Check Config” in the footer or by appending check_config.php to the URL. Exact descriptions of the available URL parameters can be found under URL Parameters. For visualization and triggering of actions such as Switching or blinds up/down uses the CometVisu so-called widgets. Widgets can be understood as graphical building blocks arranged on a page to be displayed. A widget consists of the actual visible area that receives and redirects mouse or touch events, and invisible objects that specify how the widget works in more detail. A small exception are the plugin widgets. These must be included in the “meta section” of the configuration file before use. The Page widget calls the associated subpage. The Top Navigation Display showes the current path and allows you to navigate back to parent pages. The Navbar widget in conjunction with page jump widgets. The Pagejump widget allows to call any subpage. The Group widget can also call any subpage with the option target =. A special feature is the Statusbar at the bottom of the screen. From there you can call e.g. external URLs. Overview of the most important navigation elements. A KNX group address can be used to jump to a subpage when the attribute ga=x/y/z is entered in the corresponding Page Definition. The options screensave_time and screensave_page. This will call a specified page after a defined time has elapsed. The timeout plugin works similar to the screensave function, but will also run if the subpage is called via GA. 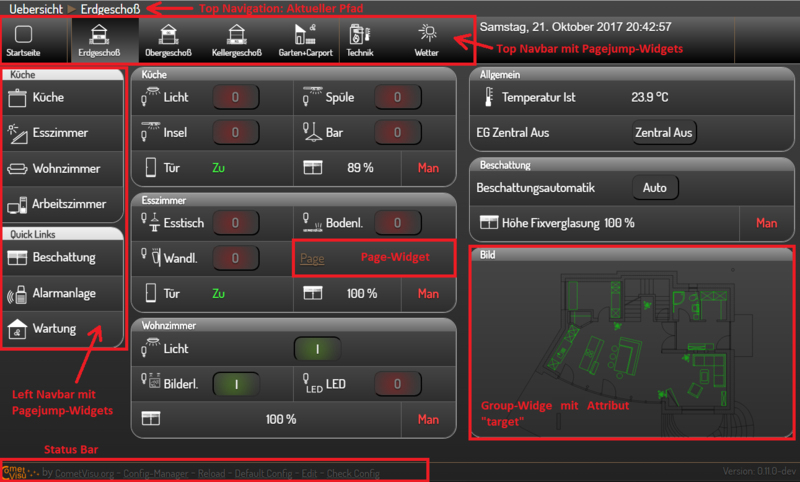 In the CometVisu the size and arrangement of the widgets can be controlled with the child element Layout. Thus, a responsive design can be realized, that adapts to the display size of the terminal from which the CometVisu is viewed. This happens not only at the time of the URL call, but dynamically e.g. also when turning the terminal from landscape to portrait or when changing the window size on the PC. Within the widgets there are different attributes like width, height, etc. available. This can be used to control the size of the widget content (e.g. image and diagram size, etc.). Format of values e.g. on number of decimal places, units etc. Flavour allow additional options for some widgets in some designs. Widgets are the individual elements that make up a CometVisu site. These can either be permanently installed in the CometVisu or integrated via plug-in interface. Here are several examples of visualizations that are in productive use.